Fengshui is an ancient science of construction that originated in China over 3500 years ago. Feng shui literally means"wind" (feng) and water ("shui"). It's the art of arranging buildings, objects, and space to achieve harmony and balance. Feng shui works on the assumption that the world is driven by unseen forces. The idea behind it is to "unblock" the way, so the forces may flow freely and create balance in life. Water features are very popular in feng shui as water is a symbol of wealth and prosperity. 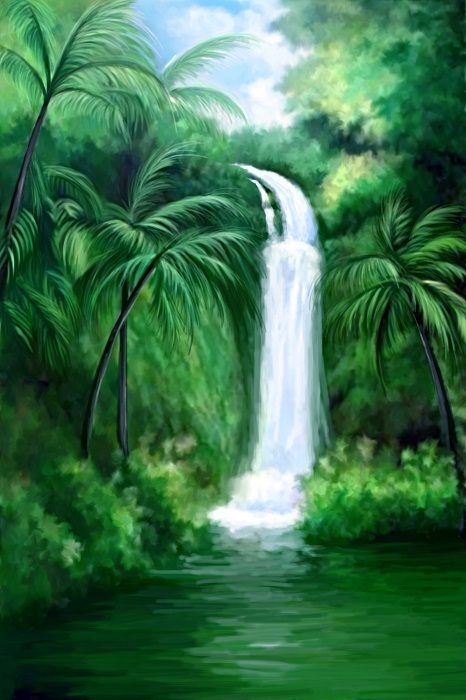 Feng Shui WaterFall Painting symbolizes good fortune.Flowing water can ease tensions and allow the vibrations of the life force to enter our space and bring flow of money. The waterfall painting in the north will help to channelize positive energy towards business and career. Our Vaastu & Feng Shui collection is developed in consultation with Vaastu & Feng Shui expert and is based on principles of Vaastu & Feng Shui. The Fengshui Waterfall Painting is Copy Right Protected. Make sure to buy the original to get the authentic quality painting. Ours is Original work done by Artist. Beware of cheap quality fake paintings. This art work is looking amazing and artist really did very nice work with use of their thoughts and combination of colors. Many people work with online assignment writing service uk for earning of money in easy way. That's an amazing artwork. instagram travel I wish I could be in a place like this in hot weather, it must be great.